Pseudomonas aeruginosa, a bacterium grown onboard the space shuttle Atlantis, forms in a "column-and-canopy" structure unlike the arrangements observed in bacteria grown on Earth. Bacteria grown in a dish of fake urine in space behaves in ways never-before-seen in Earth microorganisms, scientists say. 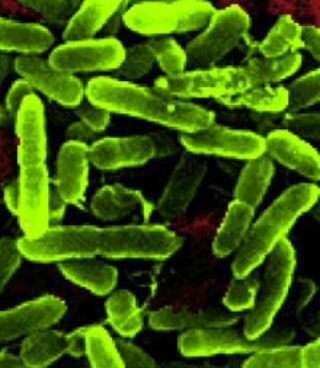 A team of scientists sent samples of the bacterium Pseudomonas aeruginosa into orbit aboard NASA's space shuttle Atlantis to see how they grew in comparison to their Earth-dwelling counterparts. "Biofilms were rampant on the Mir space station and continue to be a challenge on the [International Space Station], but we still don't really know what role gravity plays in their growth and development," NASA's study leader Cynthia Collins, an assistant professor in the department of chemical and biological engineering at Rensselaer Polytechnic Institute in Troy, N.Y., said in a statement. "Our study offers the first evidence that spaceflight affects community-level behaviors of bacteria, and highlights the importance of understanding how both harmful and beneficial human-microbe interactions may be altered during spaceflight." Most biofilms found in the human body and in nature are harmless, but some are associated with disease, NASA officials said. The space bacteria were cultured in artificial urine on NASA's Atlantis shuttle in 2010 and again in 2011 before the retirement of NASA's space shuttle program. Collins and her team of researchers used fabricated urine because it can be used to study the formation of biofilm outside and inside the body. Understanding how to safely remove and recycle waste is particularly relevant because of its importance in long-term spaceflight, NASA officials said. "The unique appearance and structure of the P. aeruginosa biofilms formed in microgravity suggests that nature is capable of adapting to nonterrestrial environments in ways that deserve further studies, including studies exploring long-term growth and adaptation to a low-gravity environment," Collins said in a statement. "Before we start sending astronauts to Mars or embarking on other long-term spaceflight missions, we need to be as certain as possible that we have eliminated or significantly reduced the risk that biofilms pose to the human crew and their equipment." Scientists sent 12 devices with eight vials of P. aeruginosa — a bacterium that can be associated with disease on Earth — into orbit on Atlantis. Once in space, astronauts on the shuttle introduced the bacterium to the fake urine while scientists on the ground began the control experiment. After the samples arrived safely on Earth, Collins and her team took a detailed 3D image of the biofilms to investigate their internal structure, and used other research methods to investigate the colony's thickness and cell growth. The study, published in the April 20 issue of the journal PLOS ONE, also could have implications for bacterial research on Earth. It's possible that this kind of research could help scientists and doctors more effectively limit the spread of infection in hospitals, Collins said.